Link: The bridge symbolizes communication and is depicted with three arches in reference to all three Royal Air Force Commands and for the three United Kingdom Armed Services. The aggressive bird with wings fully extended appropriately identifies with a “Supply Wing” and the motto clearly relates to the Wing’s primary function. 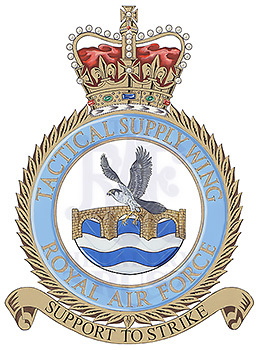 History: Tactical Supply Wing formed at Stafford in late 1970 and became operational on 1 January 1971. It remains current.